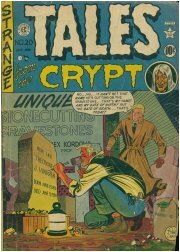 Comic: "Tales from the Crypt #20"
Plot: The Crypt Keeper spins you four blood-curdling tales to fill you with dread, along with a series of corny, horror-themed jokes, with words that are EMPHASIZED to make sure that SCARES and PUNS alike are properly NOTICED by you, the humble READER!!! Review: You might remember the Tales from the Crypt show from the early 90s, but how about the actual comic it was based on? Granted, it didn’t see too much play between the show and its original run in the 1950s, but how can you forget the very comic that introduced the oh-so-memorable Crypt Keeper? Though this one is given the number 20, it’s really only the first to run under the name Tales from the Crypt. In the previous issues, the format was pretty much the same: the story is told with the Crypt Keeper providing the intro and outro. The only real difference was that they ran under the name “Crypt of Terror”. In terms of actual terror, the four tales lack a little bit of the punch they must’ve had during the comic’s original run. Even so, the classic pulp artwork helps to draw out the horror, with looks of terror splayed across the faces of square-jawed, uniformly clean-cut young bucks, along with their emotionally-fragile female companions. 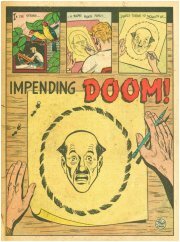 At one point, concerned parents (a group more terrifying than any crypt tale) contended that comics like this were promoting illiteracy. It seems hard to believe, given how much actual writing appears in the tales themselves, not to mention the short stories that run between them. Oh well, gotta find something to pin society’s troubles on. It kind of makes you wonder what happened to ol' John Kassir. His laugh and corny puns are what made the show memorable. John Kassir played ralph the college kid in reefer madness the musical. that's about all i know that he's been up to since tales from the crypt. the comics were great, i liked em more than the show. i would go to the local comic shop and buy the reprinted ones. It is true that all mobsters, men, and women, looked the same in the fifties. 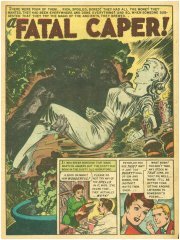 At one point, concerned parents (a group more terrifying than any crypt tale) contended that comics like this were promoting illiteracy. Oops, something went wrong. (stupid keyboard) let me try that again. I remember reading about how people once thought comic books to be a communist weapon and even went as far as to burn their kid's copies. and let's not forget Dr. Fredrick wertham's book..
Hoyt Johnson: Kassir has done a plethora of video game and cartoon voices since Reefer Maddness(which was brilliant). As far as the comics go; I used to have a handful of reprint issues growing up. Then a few years ago I managed to pick up the black and white, hardcover archive editions of both Tales and The Haunt of Fear. Now I find that there is a new set in color. Damn me and my impatience! Anyways, there are many great yarns in these comics, but there are also quite a few bad ones (and a lot of reused ideas). I absolutely love the awesome artwork. It only ran for 9 issues, but Twisted Tales definitely topped Crypt in terms of violence and gore. You should try to track those down and review 'em. Uh, my bad; Twisted Tales ran for 10 issues, not 9.